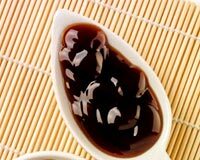 Oyster Sauce is an aromatic Chinese recipe. Learn how to make/prepare Oyster Sauce by following this easy recipe. Add chopped onions till soft. Mix oysters, oyster water, thyme, oregano, basil and minced garlic. Cook to make a thick mixture. Add this to the above mixture. Cook the sauce over medium heat for 5 minutes. Now add cream to the sauce. I love Chinese food and I love Indian food. But when did oyster sauce have "butter, onions, thyme, oregano"? Maybe Mediterranean oyster sauce but this is not Chinese. I would not mind trying this though.